John Price has returned home after multiple tours of duty in the Middle East only to fight another war inside of his own mind… PTSD. With the urging from a supportive doctor, John adopts a service dog named SARGE. Can the companionship of SARGE and the love of his girl, MARIA, save John from his inner demons? 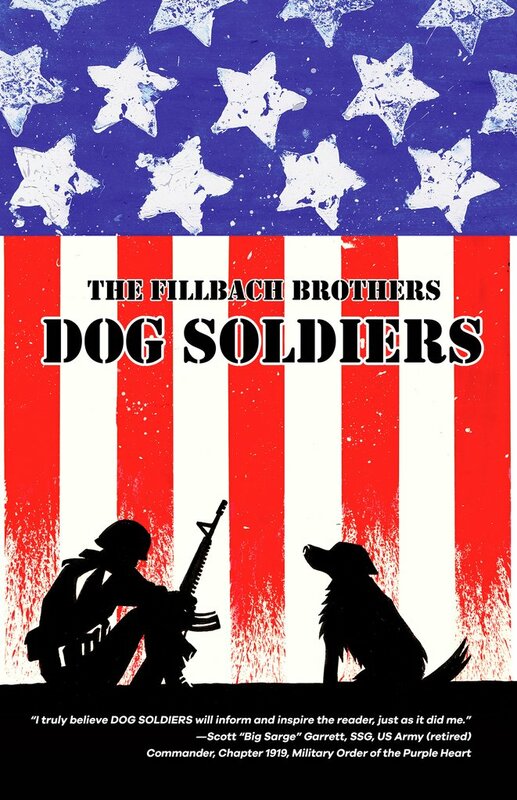 With as many as 22 American veterans committing suicide every day, the FILLBACH BROTHERS approach a crucially important American subject with drama, compassion, humor, and love. Our main character, Sarge, is chosen for a special assignment. He receives all of the training he needs to fulfill his duties, but in the end it comes down to his natural sense of dedication. To protect John Price, the man placed in his charge, Sarge will face many challenges- many of those coming from Price himself. When all is said and done, Sarge will have fulfilled the highest calling, and he will have safe-guarded his person from all threats. Sarge is a service dog, a companion to Army veteran John Price, and on the many bad days he’s the only thing that keeps Price focused on something other than the dark and twisted memories left behind by his military service. For the most part, I review comicbooks that entertain and divert. Let’s face it, things out here in the real world are messed up and there’s no shortage of negative things to think about. Being able to dive headlong into a comicbook, to ignore the swirling chaos storm around us for at least a little while is a great thing and a part of what I think elevates comics as a form of art and entertainment. And then a book like Dog Soldiers comes along and cracks me in the side of the head with a truth bomb, highlighting a couple subjects that are often misrepresented and about which the general public is too often misinformed. I’m a veteran. My service has been over for a very long time, since well before the current ongoing conflict that’s taken so many sons and daughters, but I still see many of the hiccups and mistakes made in helping our service members when they come back home. One of the things I distinctly remember is the focus on “mission accomplishment”. The mission always comes first, and then the next mission, and the next after that. To be able to maintain that level of focus is one of the many disciplines taught to members of the military. The problem is that eventually there aren’t any more missions, and there isn’t anything left to put that energy into. For many veterans, that’s when the problems start. All of the things that can’t be unseen, unheard, or unlearned never really go away… they’re just shuffled off into a tightly locked little box and eventually that box is going to open up. If there’s nothing else to focus on, to get past that flood of memories and experiences, they can overwhelm. In Dog Soldiers, this is the case with decorated veteran John Price. He’s trying to slide back into life as a civilian, but it isn’t always easy. Many of the people around him don’t understand what he’s seen, what he’s done, how he’s survived. That creates a wall that isolates John more effectively than anything else made by man, even when he’s not as alone as he often believes himself to be. Medications don’t resolve the problem, they generally just deflect it or muzzle it. When things are just about at their worst for John Price, he’s put in a room with Sarge as part of a program that provides service dogs for veterans. In that single moment, Sarge saves John’s life. The Fillbach Brothers, handling both the writing and the illustrating duties, have done an outstanding job of capturing the stress and pent up anger that many veterans are dealing with in their return to civilian life. Their close understanding of the subject shows in every panel, on every page, in ways both subtle and blatant. A letter out of the blue from a war buddy, thanking John for his friendship, is shown without any other context and it’s gut churning. When the reasons for that unease are revealed and confirmed to be true, the inevitable side effects can be felt before they’re ever shown on the page. It’s in those moments, equal parts difficult to imagine and important to at least try to understand, that Dog Soldiers is elevated to important reading for anyone who’s served or who is close to someone who has. The other factor that makes Dog Soldiers important, at least to me as a lifelong dog lover, is its portrayal of Sarge as a vital element in his person’s life. The life of a service animal can’t always be easy when you consider some of the issues they’re trained to deal with. The fact that at no time is Sarge ever really “off duty” may be disregarded by some, with the justification “well yeah… that’s what he’s for.” What really should be noted is that dogs very much like Sarge are acting as stress relievers for their people every day, without the benefit of training. It’s just what they do, how they are. It’s books like this that can put a spotlight on the benefits just having a pet can bring, and the importance of programs that provide service animals to those that need them. Not gonna lie, Dog Soldiers has some emotional ups and downs (shut up, I got something in my eye…) and this review is reflecting that. I know that most of my posts for thePullbox are a little lighter than this one, but every now and then I get hold of a book that handles topics that are a little more personal and important. In its serious and true handling of a veteran’s PTSD, and as an ode to what an influence animals can have as companions, pets, and family, this is a seriously outstanding title from Devil’s Due/1First Comics. I’ve said many times that we, in general, don’t deserve dogs, and that if we’d put more effort into being the people our dogs already think we are, the world would be a much better place. Dog Soldiers illustrates those points beautifully.